Home/Social Security/FOX is Scaring Americans With Lies About Social Security. The 2018 Trustees Report Reveals the Truth. FOX is Scaring Americans With Lies About Social Security. The 2018 Trustees Report Reveals the Truth. In recent weeks, local news channels around the country aired at least 93 news reports sowing fear and lies about Social Security. These channels, most of which are affiliated with FOX Broadcasting Co., falsely claimed that a Social Security crisis is imminent. Absurdly, the segments said that the only way to prevent supposed benefit cuts in the near future is to cut benefits immediately. Fortunately, the Social Security Trustees just released their annual report, which exposes FOX’s fearmongering for what it is. The report reveals that Social Security is fully affordable. In fact, our nation can afford to expand Social Security’s modest benefits. At its most expensive, in 2075, the cost is projected to be just 6.19 percent of the nation’s Gross Domestic Product (GDP). That is a considerably lower percentage of GDP than Germany, France, Japan, Austria and most other industrialized countries spend on their counterpart programs today. This low percentage of GDP is not surprising, given how modest Social Security’s benefits are and how extremely efficient the program is. Of every dollar spent, more than 99 cents is paid in benefits; less than a penny goes towards administrative costs. Moreover, unlike other government spending, Social Security is and, by law, must be fully funded. According to the new report, Social Security has a large surplus. The program is 100 percent funded for the next 16 years. It is 93 percent funded for the next 25 years and 87 percent funded for the next half century. Its projected shortfall over the next three-quarters of a century amounts to just 1.0 percent of GDP. In contrast, military spending increased by 1.1 percent of GDP virtually overnight after the 9/11 terrorist attacks. Spending on public education nationwide went up 2.8 percent of GDP between 1950 and 1975, when the baby boomers (the same generation now entering retirement) were school children. Instead of cutting benefits in response to a fake crisis, as FOX and Republican politicians want to do, we should be expanding them to address the real crisis facing American families – a lack of sufficient retirement income. If nothing changes, most workers will be unable to retire without a drastic reduction in their standard of living. Social Security is the most universal, secure, fair, and efficient source of retirement income that we have, providing guaranteed, inflation-protected monthly income that one will never outlive. Expanding Social Security is a common-sense solution that will ensure workers can enjoy the secure retirements they’ve earned. 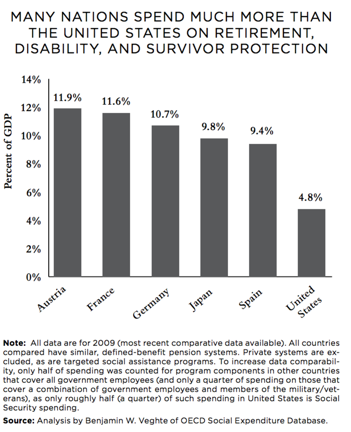 Increasing retirement benefits also automatically increases disability and survivor benefits, because they are derived from the same benefit formula. Those benefits can and should be increased for current beneficiaries, as well as all future beneficiaries. Expanding Social Security would help ease the financial pressure on working families. Adding new benefit protections, such as paid family leave and caregiver credits, would do even more. Expanding Social Security is a solution to other challenges, as well. Americans are rightly concerned about growing income and wealth inequality, particularly now that Republicans have passed a $1.5 trillion tax giveaway that went largely to corporations and billionaires. Expanding Social Security and requiring the wealthiest among us to pay their fair share will begin to reverse this dangerous inequality. The just-released Trustees Report makes clear that, despite what opponents would have us believe, the question of whether to expand or cut Social Security is a matter of values. Does our nation value massive tax cuts for the already wealthy? Or do we value protecting and expanding our Social Security system? The answer is clear. As divided as the American people are over many issues, we are not divided about our deep support for Social Security. Support for Social Security expansion, and opposition to benefit reductions, cuts across ideological divides. These views are shared by Republicans, Independents, and Democrats. They are held by Bernie Sanders supporters and by Ted Cruz supporters. Two-thirds of voters say they are more likely to back candidates who support protecting and expanding Social Security. The Democratic Party has recognized the importance of expanding Social Security benefits. House and Senate Democrats have introduced a number of Social Security expansion bills. The Social Security 2100 Act, sponsored by Rep. John Larson (D-CT), has 170 cosponsors in the House of Representatives — nearly 90 percent of all Democratic representatives. Similarly, around 90 percent of Senate Democrats are on record in favor of expanding, not cutting, Social Security. In sharp contrast, no Republican policymaker has advocated expanding, not cutting, Social Security. During the Republican primary, Donald Trump referred to expanding Social Security benefits as “what we’re up against.” And despite his repeated campaign promises to the contrary, Trump’s budget proposes Social Security cuts. Understanding how unpopular their position is, Republicans seek to hide the fact that cutting Social Security is a choice, plain and simple. Rather, they spread the lie, echoed by the recent FOX segments, that Social Security is in crisis and must be cut. They never acknowledge that we can easily afford to protect and expand benefits if we simply require the wealthy to contribute their fair share instead of giving them yet more tax handouts. Republicans and right-wing media have invented the Social Security “crisis” because they know they lose when the issue is debated honestly, as a question of values instead of affordability. Democrats running for office this November need to make their own values clear, by making Social Security expansion a centerpiece of their campaigns. If they do, voters will be able to look past the FOX lies and see Social Security for what it really is – the most successful government program in history, one that we can make even better. That’s the future American workers have earned and deserve.